EdTechTESOL › Does speaking English make people happier? Does speaking English make people happier? Certainly, I do not think that the language we use defines our mental health, but I wonder to what degree different languages lean towards positive or negative feelings… I have often heard Japanese people say that it is easier for them to express themselves in English, as they find the language less restrictive socially, but I wonder if any studies have been done on this. Visit the map in context here. This was written by Stephen Henneberry. Posted on Friday, April 18, 2008, at 12:50 pm. Filed under Links, Uncategorized. Bookmark the permalink. Follow comments here with the RSS feed. Both comments and trackbacks are currently closed. Going to have to agree with LUA. What a joke. Racist and focusing on the richer nations of the world. I know plenty of happy people in India and plenty of unhappy Americans. you are out of your mind Mr. adrian white. why don’t you wake up and leave your capitalist world and learn what true happiness actually means. 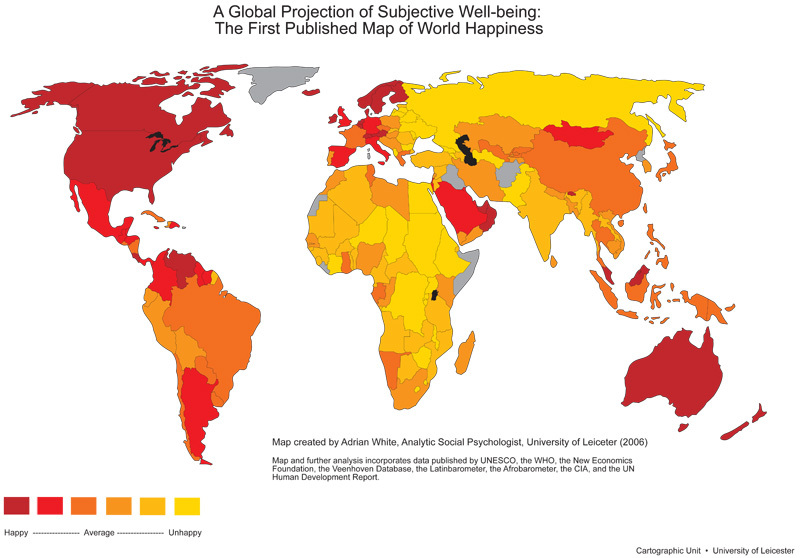 This map is based on research, it didn´t come out of inspiration of the blogger. Happiness is a very rethorical concept. However, people usually feel happy when their basic needs are covered, they feel reasonably safe, they have good expectations in life, and the security that their country will allow them to realize those expectations. Saddly, rich countries can provide more opportunities to their people than poor countries. It may not be a coincidence then that those are “happier” nations. However, it has been found out in other researches that an influential factor of happiness is the importance people give to their “relationships” and “human interaction” over “goals in life” and “materialist achievement”. Notice how Venezuela and Mexico are not rich at all and anyway they are ranked pretty high. You could blame that partially on the climate or the beautiful landscapes. In Venezuela´s case, the insecurity is overwhelming and political problems are there day to day. I believe that there prevails the importance of relationships and interaction.